God of book photography, please forgive me. 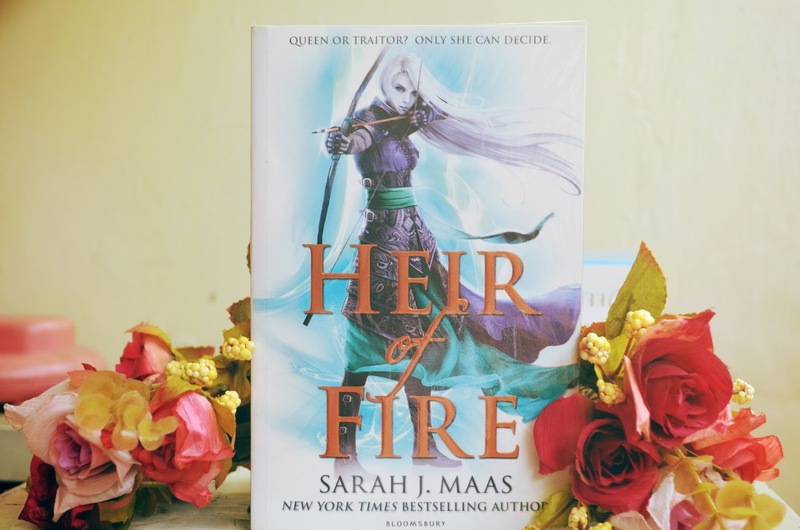 Since I have already established from my past two Throne of Glass series book reviews how much of a ChaoLaena shipper I am, obviously, I came back to the series hoping so much for some kind of making up between Chaol and Celaena somewhere in the story. But good lords, that's not what was in Sarah J. Maas's Heir of Fire. Nonetheless, even if I don't think it can compete to how well I loved Crown of Midnight, I had some fun reading this book. We were introduced to a couple of new characters in Heir of Fire. Characters that I feel would be vital in the development of the story in the following books. I was finally properly introduced to Rowan. I've seen some mentions of him in some tumblr posts and tweets before that I was so curious who he really was. He came off to me as the Fae guy who's so done with everything. To me, he was constantly grumpy and I sort of can't understand the constant annoyance he had for Celaena. But of course, in the succeeding chapters, it started to look obvious about how he was going to play a huge part in this book. Another arc introduced in this book was Manon. She's an Ironteeth witch heiress. Interesting, definitely, but her parts dragged a lot. Of course, since there are chapters for her arc, that meant she's going to play a major role in the next books. I decided to read her parts because I was thinking her story will somehow intersect with Celaena's or Dorian and Chaol's story in this book and that will make her more interesting. But it didn't intersect and it kind of annoyed me (spoiler: the inclusion of her story starts making more sense in queen of shadows). Not knowing her importance, of course, it increased the "dragginess" of reading her arc. But my favorite new character in the series was Aedion. I love how he's sort of a protective big brother towards Aelin. I love how he has the exact amount of swagger Celaena has. Also, we'll be having a big-brother figure character for Celaena and this is the kind of relationship I like reading about but don't usually see in YA books. I was excited for their reunion. The majority of this book just revolved around Celaena's training to achieve her best Fae form. It's not my favorite part of the book, to be honest, especially since in the first part, it was just Celaena and Rowan being constantly grumpy with each other. Of course, that sort of changed for the better towards the end of their arc in this book. Nonetheless, even if the buildup of their friendship was not, for me, the best thing in this book, I particularly enjoyed that talk and bonding they had toward the end of the story. That is because the first time I had to stop and breathe in this book was while reading Chaol's thoughts and sentiments about Celaena. Celaena being in Wendlyn. Celaena being Aelin. Celaena being Princess of Terrasen. BUT-- Celaena didn't even have much time to think about Chaol in this book but Chaol's first thoughts were about Celaena. I swear I was constantly wrecked by this fact that it was the only thing that helped me continue reading through Celaena and Manon's chapters. Yes, I was always more excited about what was happening back in Adarlan than what was happening with Celaena in Wendlyn. I enjoyed reading about Dorian falling for Sorscha. I enjoyed (and I had my heart ripped to pieces constantly) reading about Chaol trying to sort out his loyalties and job and morals. I loved reading more about Aedion and just knowing about him. Celaena's change to Aelin, and her acceptance of the mission to pull Terrasen back up was a great thing to see. The running away finally ended here and Celaena, now Aelin, is finally being the best version of herself. The ending of this book was a great way to make readers crave for Queen of Shadows. Unlike Crown of Midnight, you sort of know where things are headed for but for this book, you're sort of just left with questions. What will happen to Dorian now that a Valg prince possessed him? (This broke my heart the most) Where will Chaol go? What is he going to do to save Dorian? (I'm so touched with the friendship of these two) Who is Manon going to be in this story? What is Aelin's plan or strategy? All these things really pumped me up for Queen of Shadows. PS. On a totally unrelated note. I just noticed how Celaena has fire powers and Dorian has ice powers. Is there something going on with their powers that I should know? Let's discuss!